5 Comments on Kitchen Cabinet Styles – What’s Your Choice? Kitchen in a home has always occupied a special place for an eventful cooking, conversation and cozy dining. Being the most frequented area in the house, styling it becomes natural and important to keep it in sync with the home décor. With focus on functionality, kitchens are being refurbished with a host of appliances and accompaniments. No wonder then that the most important part of your kitchen – the kitchen cabinets – should be styled to suit your choice and showcase your kitchen accompaniments. Kitchen cabinet styles have come a long way from just being cupboards and shelves to being a statement of your home interior sense. From traditional wooden cupboards to a more eclectic mix of materials, they now provide fashion and functionality for your kitchen. Contemporary kitchen cabinet style – neat spaces, minimal decoration, modern fittings and stainless steel appliances. Photo courtesy of FURNISHism. 1. Traditional cabinet style: Beautiful, elegant and historic in its look, this style exudes class and elegance in a kitchen. With ornate wood work designs, dark wood or a complete off-white color palette used in cabinets… this kitchen cabinet style is sure to make an impressive statement. You can suitably choose some of the cabinets to have a glass panel, just in case your kitchenware collection includes artifacts and exotic cutlery. Apart from that, the cabinet doors can have extensive wood carving designs and can be selected from a wide variety of designs. Though this kitchen cabinet style can be a bit on the expensive side in terms of the materials used (wood, metal handles etc. ), design (intricate wooden work), complementing accessories (panel lights etc.) and maintenance, it can certainly add to the glamour quotient of your home. For cabinet wood work, you can again choose from a wide variety of themes for a traditional look e.g. Rustic, Victorian, Country, Cottage or the French look. 2. Contemporary cabinet style: “Designer, spacious and simple” defines the contemporary look in a kitchen. Glass, metal, fiberglass or plastic is usually used for designing such cabinets. Neat spaces, minimal decoration, modern fittings (sink, taps, chimneys and lamps) seem to give this style a technology edge. 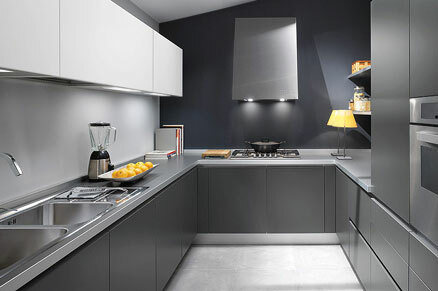 Contemporary cabinets have simple rectangular or square arrangements around the worktop and cooking areas. They do not have extensive designs on the exterior and are more affordable, low maintenance and can be selectively chosen for a neat and minimal look. With contemporary kitchen cabinet styles, you can be sure of storage in style. 3. Theme based cabinet styles: As with everything these days, kitchen too is being designed around themes. This style suits those who want everything in their house to showcase their personality. Theme based kitchen cabinet styles can be as eclectic as you want. From materials to their arrangement around the worktop and cooking area, the cabinets can be customized to a theme, for example there can be many cabinets and drawers in the dining table too to keep cutlery handy while eating. Whatever be your style, cabinets need to do their job of storage effectively. Hence, while teaming them up in sync with the home décor, choose materials for cabinets that are easy on pocket and maintenance. Since cooking area has a lot of steam and heat, cabinets near to the cooking area should be wisely chosen with materials like plastic or fiber glass – that are easy to clean and also have higher visibility to keep kitchen tools handy and in sight. Another aspect is safety. While deciding on your kitchen cabinet style, do remember that cabinets near to cooking area must be safe in case of hot spills (oil or water). While cabinet colors would depend on your décor sense, they should preferably be on darker side to avoid stains or spills from showing e.g. an off-white themed cabinet arrangement would exude class and beauty but would be on a higher cleaning and maintenance in kitchens that have a regular or heavy duty cooking. Hence functionality, ease of use, easy clean up, maintenance and pattern of cooking are factors that should primarily dictate selection of your kitchen cabinet style. The one above look very slick and I bet it is pretty easy to manage and clean too. Victorian and French country kitchens are nice, if you have the money, but I think the most recommended would be a modern, minimalist eco-friendly kitchen. The white shaker style cabinets are VERY popular right now. Many of our clients opt for these. It’s a lasting look that as personal styles change the kitchen colors and accessories can be worked around them without having to replace the cabinets. Excellent article! I have always taken the approach with my customers that they should consider the resale of their home when they are designing their cabinets. I would say that at least thirty percent of our kitchen cabinet customers select solid white cupboards. White is a neutral color that anyone can work with when decorating. Most of our clients fall into the middle class income bracket and consider resale value when selecting their kitchen cabinet style. Now on the other hand, our customers who are wealthy usually just get the color and style cabinets they really want. This is a good kitchen blog, Ganka. Keep up all the work. I too love expressing my opinions. Thanks.